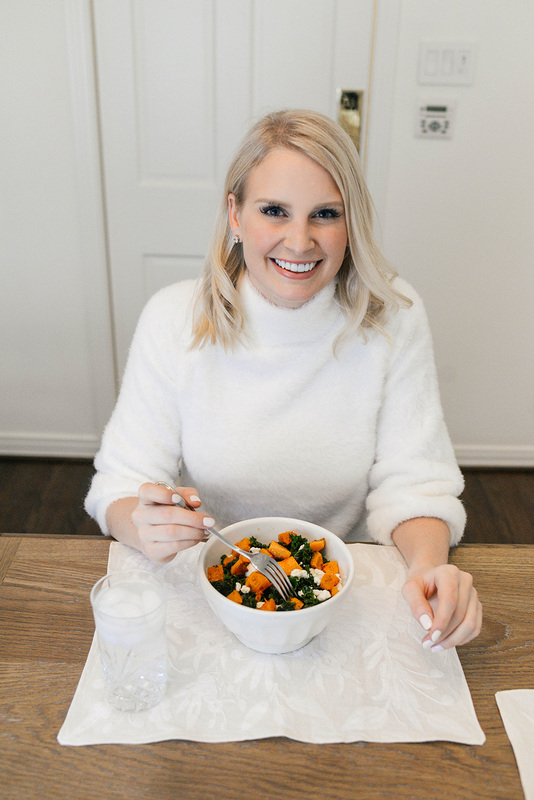 One question I’ve received quite a bit since starting BBG last year is if I could share what I eat on a day to day basis! While I don’t keep a food journal, I’m definitely a creature of habit and can easily recount what I consume throughout the week when I’m home. Below is a look at a typical week for me! I usually eat out on Friday and Saturday when I’m in town – scroll to the bottom of this post for recipes I love! DINNER // Zucchini noodles with artichoke hearts, tomatoes, onions and parmesan. QUESTION // What do you eat at night to help with your sweet tooth? I always feel like I overdo snacking after dinner. ANSWER // I nearly always reach for fruit! It’s just so easy to have on hand and I don’t feel terrible if I eat a lot of it. Lately I’ve been really loving a cup of mixed berries with some fat-free whipped cream (from a can). So yum! QUESTION // Is there any food item you can’t keep in your house because you’ll overdo it? ANSWER // YES! I cannot have any kind of chips or sweets (candy, chocolate, ice cream… ANYTHING) in my house if I’m trying to be good. Every once in awhile I’ll buy things like rice cakes or NutThins or a half gallon of Blue Bell ice cream and I almost always regret it. I go through stuff like that so fast! I have no self-control! QUESTION // How do you keep cravings at bay? Or how do you indulge without “falling off the wagon” so to speak? ANSWER // The easiest way for me to keep cravings at bay is to have a delicious, healthy alternative ready and waiting – if I’m craving sweets, I’ll have cut-up fruit at the ready. As far as indulging without falling off the wagon… I have a harder time with that. Especially when I indulge on trips or when I’m home for the holidays, I struggle with that a lot! When you’re used to eating somewhat unhealthy meals, it’s really hard to mentally re-commit to eating well – I always dread it at first, but then never regret it once I’ve gotten back on my routine. For me, I just have to rid my house of all the bad stuff so I’m not tempted – I just quit cold turkey! QUESTION // What’s the best way you’ve found to eat kale? ANSWER // I really only ever eat kale in two ways: in salad form or sautéed! A few favorite ways are this recipe from the NY Times food section, this kale salad recipe, this stir-fried kale and bacon I found during Whole30, and this Kimchi Cauliflower Fried Rice. I also eat the prepared Chili Kale from the Whole Foods salad bar near my house for lunch constantly! I looked at the ingredients last time I was there and it’s mostly just massaged with olive oil, lemon juice, salt, and red chili flakes. 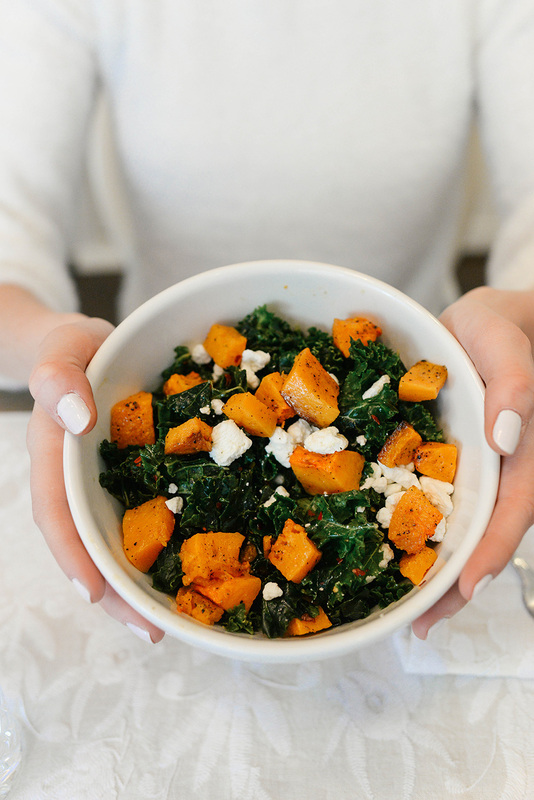 It’s such a great base for topping with things like chicken, butternut squash & goat cheese, and other savory salad toppings. QUESTION // Do you/did you ever track macros or your carb intake? ANSWER // Yes, I’ve tracked my carb intake but never meticulously and I’m not ever counting the actual numbers – I just avoid the “bad” carbs (starches and bread products) and eat the good ones (vegetables). I’ve never done the Keto diet, so I haven’t done much research into tracking macros. QUESTION // What do you order at restaurants if you’re trying to be healthy but still have a good time? ANSWER // If I’m trying not to indulge, I usually opt for some sort of hearty salad or a meat + veggie combo. For example, last week I had dinner with Amy at Origin in Dallas and I got the warm brussels sprouts salad with hanger steak. At a Tex-Mex place I may opt for a taco salad with chicken or beef, but ask for no tortilla strips. At an Italian restaurant, I’ll get chicken piccata or something like that with a side of veggies. My main goal is to avoid bread and other super starchy food – so I just order something yummy that also happens to be paleo. QUESTION // What eating plan do you feel has worked the best for losing weight? Do you cut carbs? ANSWER // After several years of my weight yo-yoing up and down, I’ve finally found that if I stick to eating mostly whole foods and lean protein I’ll lose weight. That means when I’m home and cooking for myself, I don’t eat carbs or a ton of starch (like bread, rice, pasta, potatoes, etc), sweets (candy, ice cream, cookies, etc), and very little dairy (milk, cheese, etc). I eat a ton of vegetables (luckily I love them! ), fish, chicken and steak, and a bunch of fruit to satisfy my sweet tooth. I also try to only drink on the weekends, usually just once a week – this is more difficult when going on dates, friends are in town or I’m traveling, but I never drink when I’m at home and just cooking dinner for myself. QUESTION // What are your go-to snack options? I struggle between 2-5pm! An apple – I have a major sweet tooth, so this really helps with that! It also contains a lot of water and can be very filling, all while being light and low-cal. A chia seed squeeze – I sometimes have one of these in between my FlyWheel workout and circuit training if I need an energy boost. They taste good and contain a bunch of wonderful nutrients! String cheese – I love cheese! I’m not a fan of those mini bell cheeses, but I would take a piece of string cheese any day. You’re looking at 80 calories for a regular stick, and 50 for a light one. Either way, it’s a yummy snack that’s also sort of fun to eat. Carrots and hummus – get some veggies and protein all at once with this one. Turkey – when I’m craving something salty, I like to have a few slices of roasted turkey and dip it into mustard. Like eating the sandwich without the bread! A banana – if you work out a lot, a banana is a great snack for getting potassium to those muscles. Unsweetened applesauce – this is Whole30 approved and another snack that’ll satisfy any sweet tooth. So tasty and under 100 calories! Juice – there’s a really great juice bar nearby my house called The Juice Bar, and I love their fresh pressed juices! The one I like best is Skinny Greens, and it’s 150 for the whole drink. It’s tasty, low-cal and you get a bunch of great nutrients from kale, spinach, and more! QUESTION // What are your favorite recipe resources? Where do you look for inspiration? ANSWER // I pin recipes A LOT. That’s where I’ve found a bunch of the recipes you see above! Be sure to follow me on Pinterest and check out my boards HEALTHY EATS, SAVORY, SWEET and so on. I also follow several food bloggers on Instagram that I really like, including Nom Nom Paleo, Skinnytaste, A Cozy Kitchen, The Defined Dish, and more. QUESTION // What are some of your favorite salads and meals to make at home? ANSWER // Below are some of my favorite recipes I’ve made over the last few years – all I’ve made more than once and are delicious!!! As you’ve heard me say before, I’m a creature of habit and don’t get sick of recipes – I make these over and over again. Most are mindlessly easy and make excellent leftovers if you’re cooking for one like I am! This is SO helpful!!!!! I’m trying to eat healthier now that I’m in the second trimester and have an appetite again. Thanks for linking to all the recipes! !